Biomatic parts washers utilize the latest technology from biology and industrial sciences to create an environmentally friendly parts washer. Parts that require cleaning are placed into a heated parts washer containing a PH neutral solution and a microbe colony. Using microbes, which are small living organisms that were designed to break down hydrocarbons like grease and oil and convert those hydrocarbons into carbon dioxide and water.The bioremediation process is enhanced by the units’ aeration and filtration system. The aeration system circulates and adds oxygen to the solution to increase the microbial activity. 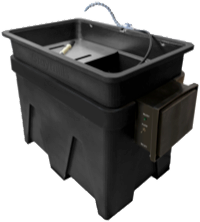 The filtration system consisting of a pre-filter, stainless steel strainer and replaceable polypropylene cartridge, constantly cleans the solution to make this complete system almost self sufficient with the occasional addition of new microbes to refresh the colony.The advantage to users is that the cleaning fluid almost never needs to be replaced, thereby eliminating any hazardous waste disposal. This heated environmentally friendly parts washer uses hydrocarbon converting microbes to reduce solid waste and virtually eliminate fluid disposal. The hydro-carbon converting microbes are added to the cleaning solution and break down oils, grease and other organic impurities into water and carbon dioxide. The advantage for users is that the cleaning fluid almost never needs replacing. Ph neutral, aqueous based solutions blended with specific emulsifiers and surfactants for use with our Bioremediation parts washers to help the microbial process work faster and more effectively while still delivering excellent cleaning performance. Cleans Carbon Deposits, Soft Coating, Light Grease, Gummy Residues, Oils, Paint, Latex, Rust Preventatives, Varnishes, Light waxes. Cleans Carbon Deposits, Soft Coating, Light Grease, Gummy Residues, Oils, Paint, Latex, Rust Preventatives, Varnishes, Light waxes.Concentrates mix with regular tap water at a ratio of 19:1 to make 20 gallons of cleaning solution. This solution is a great addition to your environmentally friendly parts washer. Tackle toughest grease and grime with these solutions. Ideal for the smallest delicate parts. Pressure Washer Industry needs to comply with the EPA standards. Choose the highest quality pieces for your engine equipment.